This relaxing Longboat Key 3 bedroom home has everything you could want for your vacation away from home! Villa Lyons is an open airy 3 bedroom /2 bath canal front home. Bring your boat and tie up right on your back yard dock. Walk down the street to the beautiful beach or jump on a boat and head straight out to the Intra-coastal the cut to the gulf is only minutes away. Ask about discounted monthly rental rates. Relax by the heated pool on the screened in lanai. Enjoy outdoor living at its best as you watch the peaceful water and birds out back on the serene canal while sipping a cool drink and grilling your steaks on the charcoal BBQ. You may even encounter a dolphin or manatee swimming by. Feel free to cast off the dock to see what you will catch or maybe you'd like to rent a boat nearby and check out the sites. The house is easy one level living. 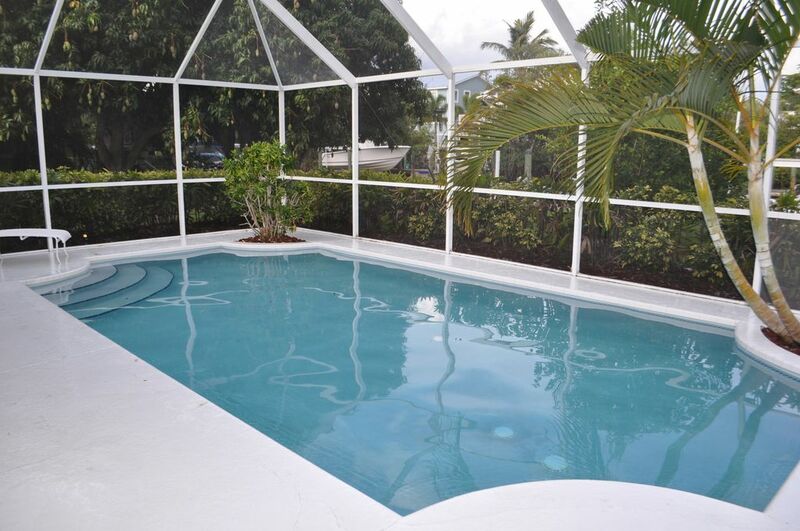 There is a spacious living room with a flat screen tv and generous view of the lanai and pool. Plus the third bedroom is arranged to double as a second family room where kids can play games or adults can setup their computer workstation. The dining room accommodates large family gatherings, seating up to 10. And for families with dueling computers it makes an excellent work area. Take a short stroll up the peaceful streets of Sleepy Lagoon to the uncrowded white sandy beach. The sunsets at the beach are absolutely breathtaking! There is even an outdoor shower with hot and cold water, perfect for enjoying the balmy breeze on your skin after a day at the beach! The master bedroom features a king-size bed, bedroom number two has a queen and in the third bedroom/den area there are two twin beds along with a desk for your computer. This home has high speed wireless internet access so you will be able to work efficiently or just keep in touch with family while you are away. The computer setup in the den will keep all your paperwork out of site; or you can sit by the pool using the wireless internet access. Signup for a nature tour and relax in the beauty of North Longboat's coastal flora and fauna. The house is situated on a quiet dead-end street with minimal traffic. There are no homes across from you - just quiet mangroves along the bay. The grassy backyard is a terrific place for kids to play. Go to our website to see more pictures of the house. The link can be found further down on the VRBO page, or email us and we will send you photos. Longboat Key is on the West Coast of Florida, near Sarasota and one hour south of Tampa. Sought-after Longboat Key has some of the most unspoiled beaches in the area. Our access is only three blocks away from our home where you have the feeling that you have your own private beach. Longboat boasts some of the wealthiest residents, and finest restaurants in the Sarasota area. Perhaps you would rather go for a round of golf or a game of tennis nearby. From this home, it is a matter of minutes to golf courses, tennis courts or shopping! Saint Armand's Circle, a shopping paradise is about 15 minutes away. Longboat Key is a ten-mile long barrier island attached at each end by a bridge to the mainland. If you would like to go to theme parks - we are one hour from Busch Gardens of Tampa Bay or two-and-one-half hours from Disney and Universal Studios. Galleries, museums, and live theater are within a 25-minute drive. We hope you will enjoy Longboat Key as much as we do. This is a special place that we would love to share with you. We do a lot of boating and beaching while we are here. The small islands and sandbars provide a great playground for little and big kids. And the dolphins make you smile. We love to walk down to the beach with a glass of wine and watch the beautiful sunsets. It is the perfect end to another lovely day in paradise. As an added bonus, we have relatives in the area and always enjoy getting together with family for special occasion or an afternoon of sailing. We love the short walk to the beach and direct access to the InterCoastal Waterway. We have friends on one of the islands in Sarasota Bay and love to boat over to visit them. There are so many things to do here -- there is something for everyone. Terrific golf and tennis. For the water lovers you can power boat, kayak, sail, and jet ski. And then there is the beach -- nature's playground. The beaches are wide, the water is clear, and the surf is calm. If you prefer to play in your own backyard you can swim in our pool or hang out on the dock and watch the fish and birds at play. And when that urge to shop hits, your car will find it's way to the fabulous St Armands Circle. A short drive into Sarasota opens up the arts - you can enjoy theatre, gardens, museums and so much more. The restaurants are great. From the seafood salad at Starfish to the chef's special at Euphemia Haye - you can't go wrong. There is something for everyone on Longboat Key. Canal front property -- minutes to the Gulf of Mexico. Kayak up the canal to the intercoastal or roll them across the street to the bay access one house away. Pool heat also available for a fee. Beach and bath towels included. Dining room table seats 6. Plus there is a dining nook in the kitchen that seats 4 overlooking the canal. Feel free to enjoy and swap out your book for one of the houses fiction books. There is even a cookbook in case you need to lookup a recipe. Mangoes, Oranges, Lemons and Lichi nut fruit can all be found on the trees in the backyard. Fresh citrus for your beverages! Bring your boat and tie up to the dock. You can rent a boat at one of the local marinas. Note the boat lift is not available for renters. Seating around the pool and on the dock! Patio on the front porch is shaded and great place to cool off in the evenings. Two public tennis courts are available in Longboat. Bayfront park has hardcourts on Sarasota Bay. Longboat Tennis center has clay courts and hardcourts and lessons. Had a fabulous time. Great house. Great location. Extremely clean and maintained. Loved being able to dock the boat in the back on the canal. Definitely coming back to stay. Our family had a wonderful time at this property. The pool was a wonderful addition to have; along with the access to the Bay. We rented a boat a couple of days and tide up to the dock. The home is clean and well stocked with towels, beach chairs and the essentials. The beach across the street is great!! Beautiful home & area! Had a wonderful stay here. The house has a great layout with a large living room and open floor plan. Bedrooms are private and quiet. And everything is neat and very well organized. Loved the heated pool and screened lanai. It's located on a very nice street, backing onto a canal with terrific birdlife - great blue heron, little blue heron, green heron and a resident anhinga who came by every evening to dry off in the canal mangrove. Plus, ospreys nesting right up the street. In the bay, you can see and hear the mullets jumping, and an island rookery filled with nesting birds of all sorts in the distance. The beach is a short walk or even shorter bike ride away. With no crowds, you can watch the waves come in, look for shells, or enjoy the beautiful sunsets to your hearts content. We look forward to coming back to this lovely oasis next year! We are so happy you signed up to come back next year and that you enjoyed our home as much as we do! We had a wonderful relaxing week in this beautiful home! We enjoyed the pool and the long stretch of gorgeous beach. There are so many things to do in the area and the weather was perfect. The house is so comfortable and well equipped that we felt at home from the first day and are hoping to be back soon. The house is in excellent condition and quite clean. It is well situated on Longboat Key and is convenient to restaurants (recommend the Blue Dolphin for Breakfast-about a 3 minute drive), the beach and shopping (St Armand's Circle). The property is pet-friendly and our Westies did well during their stay. The dock is in very good condition and the channel is reasonably wide. If you do bring a boat in, I highly recommend studying a detailed chart, as their are many shallow spots in the area. You can not make a direct entrance into the channel from the ICW, as there is sandbar in the way. That said, if you go one channel south, it is a very easy entry. I would highly recommend getting out on the Bay and the Gulf if you get the chance. We had a great week and would return to the house again on a future vacation.